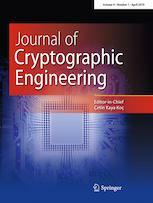 The Journal of Cryptographic Engineering (JCEN) offers high-quality scientific articles presenting methods, techniques, tools, implementations, and applications of research in cryptographic engineering, including cryptographic hardware, cryptographic embedded systems, and embedded security. JCEN aims to serve the academic and corporate R&D community interested in cryptographic hardware and embedded security by offering a focused journal drawing together archival papers that are presently scattered across various journals. JCEN’s broad and varied coverage includes Cryptographic Hardware for both pubic-key and secret-key cryptography; Cryptographic Software for embedded systems, including implementation, libraries and cryptographic algorithms targeting embedded devices; Attacks and Countermeasures; Tools and Methodologies; Applications and Implementation Environments and more. JCEN benefits the academic and corporate R&D community interested in cryptographic hardware and embedded security.